The M56 Scorpion is a Rank IV American tank destroyer with a battle rating of 6.3 (AB) 6.7 (RB/SB). It was introduced in Update 1.63 "Desert Hunters". 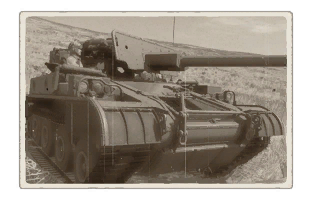 Though one of the lightest tank destroyer in-game, its 90 mm gun gives it a very powerful punch, including a HEATFS round that can penetrate 320 mm of armour. Wheel armour value is 1 mm thick, sprocket and idler wheel are 20 mm thick, and tracks are 15 mm thick. Ammo racks of the M56 Scorpion. The M56 Scorpion is a fast, light tank destroyer. It has very little armour installed, with only the gun shield having armour with a thickness of 5mm. A rapid volley from an enemy machine gun will knockout the three crew members with ease. If not carefully concealed. Its 90 mm M54 cannon is very able to disable enemy tanks at Rank IV. It is able to perform various destruction missions utilising various tactics. An M56 Scorpion is a dedicated airborne tank destroyer with airborne vehicle-based performance. The scorpion has a very stable and fast rate of acceleration on any terrain with a top speed of up to 28 MPH (45 km/h). With its high speed, it is very tempting to charge towards the capture point. When in a situation where a single enemy tank is present, unprotected, uncovered and separated from the opposing team. A rampaging Scorpion will be able to close in, then blow it up to kingdom come. However, caution must be undertaken throughout. Be wary that any tank, even if only armed with a machine gun, is capable of knocking out the M56 due to the exposed crew. One particular enemy to keep an eye for is the ASU-85. It's a complete soviet equivalent of the Scorpion. Its stock BR-372 APCBC-HE is hopeless against a Scorpion since it will always overpenetrate it & unable to explode inside its engine or gun breech. Meanwhile the M82 APCBC-HE has the opposite effect against it, just when the ASU-85 has 45 mm armour just like the T-34-85, it was a big mistake. Even with inferior penetration, an M82 still has 1.5x more explosive warhead. Given enough penetration, it will always be able to explode it frontally without much effort. Take a grain of salt when firing ASU-85 from its flank, since the M82 will also overpenetrate away. Loading the M71 HE is much better, since the explosion will spam the ASU-85's interior all over the place. Or if already loaded with M82 & an ASU-85 is coming in showing its flank, Aim for the engine to prevent it from recovering & escape. Then blast it away. While the Arcade Battle environment is not favorable due to the marker system easily spotting the M56, it can still perform in flank and surprise attacks if employed properly. It still can snipe from far away & make score some targets when the M431 HEATFS is unlocked. Be aware that a lot of light tanks can hunt it down if caught in firing range, particularly the M41A1 Bulldog and T92. The battle environment is more favorable in Realistic and Simulator Battles. It can completely perform full flanking manoeuvres even when stock, it can also snipe from far-distance without getting spotted easily. Using both tactics will guarantee a complete concealment from the enemy, while being able to launch M82 APCBC-HE at them with just a couple of shots. Closing in to the enemy is only viable if the enemy number has been completely depleted and/or are unable to insert reinforcements to cover their team. Closing in, the Scorpion can out manoeuvre and outflank most, if not all enemy vehicles at its BR. When it is unable to flank due to tight enemy formation across the map, sniping is be the best option. It is recommended to Load: M431 HEATFS or M82 if the enemy armour is insufficient to withstand such rounds. I.e. T-34-100). The reload time can help it to outgun any opposition, to withstand its sustained rate of fire. Especially if it is equipped with an Ace crew, which can reload around of 7 seconds. Also, try to use an ambush tactic. It can annihilate a whole team if used by a skilled player. Very small profile (68% visibility). Excellent mobility & maneuverability on all terrain (45 km/h top speed & acceleration, 20 km/h reverse speed). An airborne vehicle, very, very light (7.1 tons). 90 mm gun with ammunition selection from the M48A1 Patton. Heavy recoil fired from a hill will sometimes save the vehicle from enemy fire, explosive push. Very quick sustained reload time. 3 variety of very capable shells. APCR as stock shell; big penetration bonus from the start, also free. Destructive APCBC-HE; can bake a tank's interior through side shot. 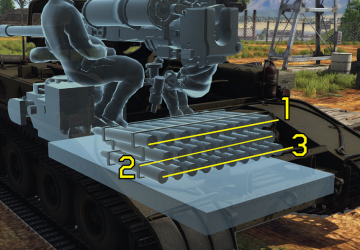 HEATFS can easily punch 320 mm of armour. Completely exposed crew from 360°. Gets easily tipped over because of its weight. A shot through the bulletproof glass will knock-out 2 crews, then instantly disabled. Top speed is limited at 45 km/h. While boasting excellent acceleration, it will be outrun by other light vehicles on open field. Heavy recoil will make the vehicle jump back about 5 feet, forcing a realignment of the sight. High chance to catch fire when shot in the frontal hull. Hopeless if its engine is destroyed. APCR as stock shell; unable to cripple a tank even from flank with only a shot. HEATFS are expensive (640 SL, per round). Affected by the Hull Break mechanic (Large HE shells will destroy the M56 in 1 shot). During World War II, the constant problem for the US Airborne divisions is that their anti-tank power was very minimal in the front lines. Though there were attempts to improve their firepower with towed anti-tank guns or airborne tanks like the M22 Locust, the former proved too cumbersome and heavy while the latter proved too under-powered and weak. Thus, development began in April 1949 for a very lightly armoured vehicle to mount a hard-hitting gun with heavy emphasis on firepower, speed, and with as little weight as possible. This evolved into the development of a self-propelled 90 mm gun and the project was taken up by the Cadillac Motor Division of General Motors. The pilot vehicle developed were designated T101. The first models were completed in 1953 and were tested in 1955. It was approved for service in 1958 and designated as the M56 90mm self-propelled gun, or by its nickname "Scorpion" and its acronym SPAT (Self-Propelled Anti-Tank). It's main selling point was being light enough at only 7 tons to be lifted by helicopter or carried onto aircraft, allowing for parachute drops. As a rather specialized vehicle, it wasn't produced in large numbers, with only 150 units built from the Cadillac production line from 1953 to 1959. The M56 Scorpion was issued out to airborne and anti-tank units from 1958 to the early 1960s. 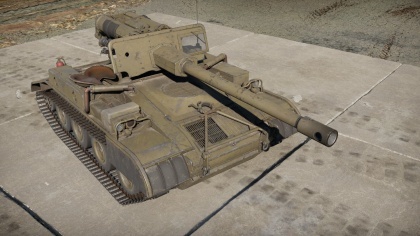 As a defensive weapon, the M56 Scorpion was never meant to venture out to seek and destroy enemy tanks, but its lack of armour was still criticized by its crew, what with only a simple gun shield blocking the crew from getting shot by even small arms. The lightness of the vehicle was also bad for the extreme recoil of the 90 mm M54 gun, which would lift the entire vehicle off its front wheels. An informal manual even recommends that when firing, the commander and loader should step off the vehicle to avoid being harmed by the lurching vehicle. The M56 Scorpion served America in combat during the Vietnam War in the 173rd Airborne Brigade, with 17 vehicles organized into three platoons. It served as a defensive role in most of American foreign bases until the advent of the anti-tank missile launchers such as the TOW, which proved more potent than the Scorpion, and was replaced in the late 1960s and early 70s. The M56 Scorpions were also given out in limited numbers, with Morocco given 87 vehicles and Spain obtaining 5 in the Military Aid Program. Morocco used the Scorpions in the Western Sahara War, being the only foreign user of the M56 Scorpions. At least 18 intact M56 Scorpions survive in the United States today, mainly in museums and in private collections. This page was last edited on 17 January 2019, at 07:11.